Clutch need to disconnect the engine crankshaft and the power transmission shaft. This need for short stops of the tractor and the inclusion of various programs, and for the gradual, ie shockless compound of the rotating shaft with a fixed transmission power mechanism. 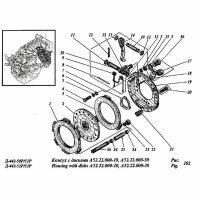 The clutch protects the motor and the power transmission from failure during a sharp change in the number of revolutions of the engine or during a sudden and sharp change in velocity. The A-41 and A-01, using 2-MS disc with an outer diameter of the friction discs 350 mm. Are permanently closed. The clutch is installed in front of the flywheel plane. The outer part is covered by its cover. Leading parts consist of a flywheel, extreme and middle leading cast iron discs, which with the help of 3 spikes leading pads are attached to the clutch cover. The slave of the presented steel wheels with friction linings, which can easily move in the shaft splines MS. Release lever fastened with bolts through the thrust washers and nuts that are simultaneously being adjusting. On pressing on the support foot squeezing levers ends with a short press on the shoulder thrust washers and nuts thereby diverting extreme presenter. disk. Average drive plate moves away from the flywheel to the clutch off under the action of squeezing the springs installed in the flywheel holes. When the clutch is engaged soot. discs are compressed spring force the screws are screwed all the way into the middle disk, and then unscrew 1 turn and nut lock it allows off coupling medium drive into the correct intermediate position. During the off switch on the release lever clicks off the clutch in which the body is pressed into the angular contact ball bearing № 46118. casing CF easily shifted by means of the fork shaft via a tubular shank rear bearing housing. The shaft rotates in 2 rolling bearings - a roller № 292208 without zapressovanym inner ring in the bore of the flywheel and back directly into the housing. Front bearing is sealed and stamped samopodzhimnym gland washer. The grease is pumped through the radial hole on the flywheel. For ventilation of the cavity on the clutch cover is located the hatch, which is closed with shutters. Through this hatch make the adjustment and lubrication of the thrust bearing. During assembly and wear in manual adjustment is necessary tripping device. Full speed is obtained by adjusting the lengths of the rods, which are connected with the clutch lever and pedal tractor and must be in the range of 14-18 mm. Provided stroke equal to 14 mm, the shaft is rotated by hand. In order to eliminate imbalances need static balancing together with the housing, the drive plate, the release lever and power spring with glasses. For this purpose, the clutch assembly is attached to the disk device on two pins and produce balancing of the machine by screwing bolts into different masses cover up to 400 g / cm.